(Nanowerk News) Delving into the world of the extremely small, researchers are exploring how biodegradable nanoparticles can precisely deliver anticancer drugs to attack neuroblastoma, an often-deadly children's cancer. By bringing together experts in pediatric oncology with experts in nanotechnology, researchers at The Children's Hospital of Philadelphia aim to thread the needle of delivering effective doses of cancer-killing agents while avoiding toxicity in healthy tissues. The team's new research shows that this approach inhibits tumor growth and markedly prolongs survival in animal models. "These nanoparticles allow us to get more 'bang for the buck'--greater efficacy at lower total doses," said Garrett M. Brodeur, M.D., a pediatric oncologist and expert in neuroblastoma at The Children's Hospital of Philadelphia (CHOP). "The nanoparticles are designed to slowly deliver a drug to the tumor, where it kills multiplying cancer cells, with lower toxicity to the systemic circulation." Brodeur's group collaborated with a group of CHOP nanotechnology researchers led by Michael Chorny, Ph.D., in a study to be published in print May 1 in Cancer Letters ("Nanoparticle delivery of an SN38 conjugate is more effective than irinotecan in a mouse model of neuroblastoma"). Chorny, in turn, led a study to be published in the May print issue of Biomaterials, in collaboration with Brodeur's group and with Robert Levy, M.D., and Ivan Alferiev, Ph.D., both members with Chorny of a cardiology research group at CHOP. That paper described how the team engineered the specially formulated nanoparticles. This approach, explained Brodeur, exploits one vulnerability of tumors--called the EPR effect, for enhanced permeability and retention. "Tumor blood vessels are more leaky and disorganized than blood vessels in normal tissue. In healthy tissue there are tight junctions in blood vessels," he said. "But tumors don't have those tight junctions and have inefficient circulation, so the nanoparticles we deliver bypass healthy tissues, but accumulate in tumors where they release the anticancer agents." Neuroblastoma is a solid tumor of the peripheral nervous system, often appearing in a child's abdomen or chest. The most common cancer in infants, neuroblastoma accounts for a disproportionate share of cancer deaths in children, with cure rates lagging behind those for most other pediatric cancers. Brodeur, Chorny and colleagues used their nanoparticle formulations to deliver a precursor of SN38, the active form of irinotecan, a conventional anticancer drug used for the past 20 years against relapsed neuroblastoma. In laboratory mice, the study team compared results obtained with the nanoparticle-encapsulated SN38 to those using a comparable dose of irinotecan. The injected nanoparticles delivered SN38 to the tumor in amounts 100-fold higher than irinotecan, with sustained drug presence over at least 72 hours, and no evidence of toxicity in the mice. In addition, most of the mice survived tumor-free for over 6 months after nanoparticle delivery, whereas all the mice treated with irinotecan had tumor recurrence shortly after treatment stopped, and they all died shortly after. The nanoparticles in the study are ultrasmall, less than 100 nanometers in diameter (a nanometer is one-millionth of a millimeter, much tinier than red blood cells). "We carefully adjust the size of the nanoparticles to find a 'sweet spot': small enough to penetrate a tumor, and large enough to carry a therapeutic payload," said Chorny. "We can also adjust their composition to keep the active molecule entrapped in a polymer until nanoparticles reach the targeted tumor, and customize the timing of the polymer's breakdown to allow controlled release of SN38 over a time scale that provides the best therapeutic effects." Brodeur aims to translate these preclinical results to human trials within the next year. "We envision targeted delivery via nanoparticles as a fourth arm of targeted cancer therapy," he said. 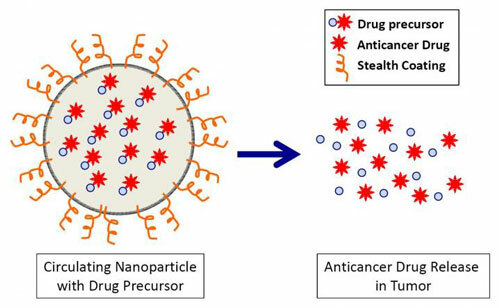 Brodeur added that if nanoparticle delivery proves its worth in clinical trials, it may join three other molecularly-targeted innovations in pediatric cancer treatment already available at CHOP: immunotherapy using bioengineered T cells, radioactive isotopes that preferentially bind to cancer cells, and kinase inhibitors that interrupt abnormal signaling triggered by cancer-driving mutations. Some nanoparticles are already being used to treat adult cancers, but if the current technique achieves clinical success in neuroblastoma, it would markedly strengthen the arsenal of approaches currently available for treating a childhood cancer. It holds the potential for broader applications, as well, to deliver other drugs and to treat other cancers currently treated with irinotecan, and perhaps even those that are currently considered resistant to this drug.